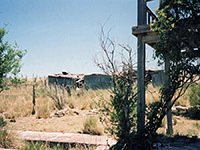 There must be thousands of abandoned houses in New Mexico. This is a brief description of one of them - built on wide open grasslands near the edge of a gently sloping valley (Horse Lake Canyon, a tributary of nearby Hogadero Canyon) just west of farm road CRE 010 in Lincoln County, 20 miles from the nearest village - Encinoso, on NM 246. 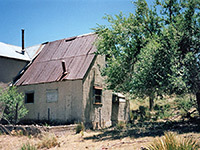 In this tranquil location there is a cluster of half a dozen buildings a hundred meters from the road - the main family house, a cattle shed, a garage and several storage buildings. 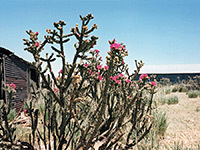 All are abandoned; cattle still roam the area, but most of the buildings are partially collapsed, overgrown with long grass and clusters of opuntia imbricata cacti - a bushy variety with startlingly colorful purple flowers in late spring. The house has become a nesting site for many small birds, which fly in and out through broken windows. At the front, remains of a cultivated garden are still evident, with out-of-control rose bushes around the base of a trellis beneath a first floor balcony where the owners must often have sat and contemplated the vastness of the treeless plains to the east. Most of the house is now empty; just the cooker and a several oddments of furniture remain, with the exception of the front room on the ground floor. This has a mattress, a few items of clothing and an office desk, and is filled with thousands of bills, receipts, bank statements, invoices and other assorted business documents - in piles on the floor, in shoeboxes and drawers, all seemingly undisturbed for at least 20 years. Some information can be gathered about the former owners from inspection of these papers. I would be most interested to know how this property came to be deserted, so I mention a few details below, in case anyone can provide an explanation. 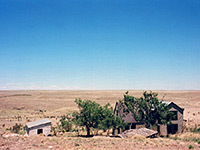 The family owned a ranching business, in the name of A.E. Davis & Son, the wife of the owner being Ruth Davis. In 1964 their address was 4100 Glenwood Dr., Brownwood, Texas 76801 Between 1969-1974 it had changed to The Brownwood Ranch, Route 1, Eden, Texas. None of these thousands of documents appeared to be dated later than 1974. How did they come to be abandoned 500 miles away from Eden, and why is there no information relating to this particular house? I hope to find out one day. 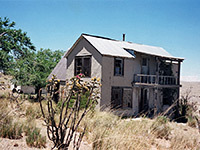 But in September of 1953, we drove away from Sawtooth Sunset, leaving our home behind. It was a beautiful, clear morning and as we topped the hill and could see the Capitan Mountain it was as if nature had willed that it be a breathtaking, last look. Every pine tree on the distant peaks stood out clearly. I stared at the dear picture, not even trying to hold back the tears that were trickling down my face. The hustle and bustle of packing for the move had occupied us for a long time, but now it was for real. Never again would I come home there again. If I did venture back, which I certainly did, it would not be home. 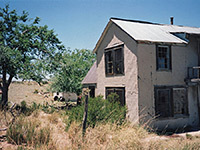 The house was not lived in again, though it passed via a realtor from San Angelo to the Davis family, who lived for a time in a ranch a few miles away and used this dwelling as temporary accommodation for farm hands and later for storage of documents of the type noted above. Ownership passed from the elder Mr Davis to his son, then his son's wife. 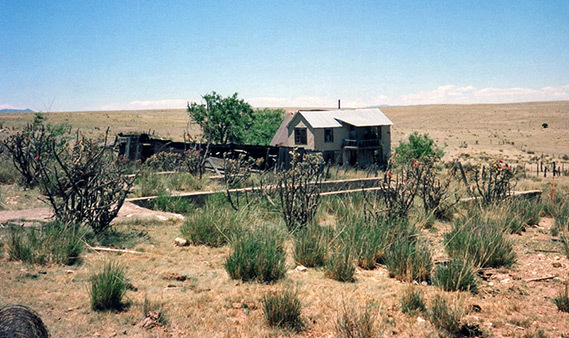 Now the property apparently belongs to the group who operate the Hubbard Museum of the American West in Ruidoso, so may potentially one day be restored and presented as a well preserved example of an early homestead. They have recently installed 'No Trespassing' signs at the entrance, though otherwise the site remains intact, peaceful and undisturbed.